Window shopping will take on a whole new meaning for you and your senior loved one this winter. Walking around the mall to squeeze in a workout is becoming an increasingly popular trend. After all, the location is ideal: the mall provides plenty of space to walk, the temperature is controlled and it's free if you can resist purchasing anything. While power strolling from store to store is certainly safer than walking on ice-covered pavement, you should still use certain precautions when taking along an older adult. Other shoppers may have tracked in slush, making the floor slippery. Equip your loved one with non-slip shoes, and be on the lookout for any puddles. Additionally, you don't want to exercise in a building when you're dressed for the outdoors. Walking in scarves and heavy jackets will make you uncomfortably hot, and seniors are more prone to becoming overheated, according to Everyday Health. See if your shopping center has lockers or a coat check to store your gear. 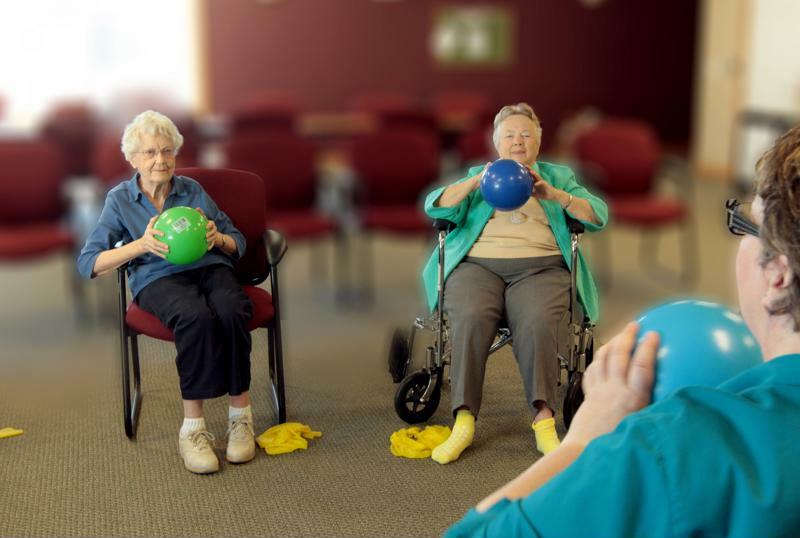 Assisted living communities offer group exercise classes. If your senior loved one resides in an assisted living community, he or she can participate in group exercise classes this winter. Senior living staff members adjust the workouts to fit seniors' needs and capabilities, so you never have to worry about your loved one overexerting him or herself. Plus, these classes are held indoors – keeping participants out of the cold. Group exercise classes may work out both the body and the brain, since the program gives seniors a chances to talk and spend time together. According to the University of Rochester Medical Center, socializing later in life can reduce one's risk for depression and Alzheimer's. "Trudging through piles of snow is a workout in and of itself." Your senior loved one hardly needs any equipment to turn his or her living room into a home gym. In fact, he or she may only need a TV and workout DVD. Senior-friendly fitness videos are available both online and in stores, and they guide participants through the exercises step by step. This way, your senior loved one can get a professionally led workout while staying safe and indoors. Tell your loved one to have a full glass of water ready before beginning the workout to stay hydrated. Have the individual keep a phone nearby so he or she can call for help if the workout causes an injury. Make sure the older adult has a workout space clear of any objects (or pets) to prevent tripping. Your senior loved one doesn't have to complete all winter workouts indoors. The snow provides a fun opportunity to enjoy the season – just make sure everyone dresses appropriately for the weather. Consider inviting the older adult in your life to help your kids build a snowman or judge a snowball fight. The extra effort it takes to trudge through the piles of snow is a workout in and of itself, and it gives your senior loved one an opportunity to spend time with the grandchildren. With a little creative thought, it's clear that winter still provides plenty of opportunities to work out. Make sure your senior loved ones stay fit and safe this season.